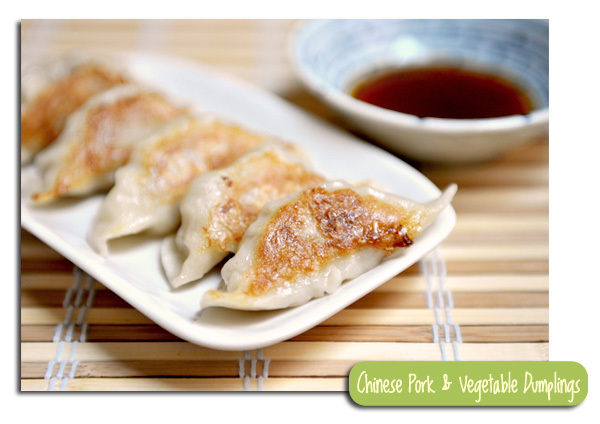 Chinese are obsessed with all sorts of dumplings, we have them pan-fried, steamed, or even in soups. I like to make my own whenever possible. That way, I am in control of what goes it and its seasonings so they can be quite healthy and delicious. Compared to store-bought ones, of course I prefer my homemade version. There are endless ways to make them and they differ in different regions of China. In Mandarin Chinese, they are called “jiao-zi” or in Cantonese, “gao-ji” and “gyoza” in Japanese. Sometimes they are called “pot-stickers” if they are pan-fried. The way I make them is definitely influenced by Cantonese cuisine. The napa cabbage in the recipe is pickled by using salt to extract the water, resulting in a crunchy texture. It is then mixed into ground pork shoulder, I find this cut of pork works well in this recipe because it has a good texture that isnt too soft nor too stiff. To make a tasty chive variation, you can also add chopped Chinese/garlic chives directly into the pork in place of the picked napa cabbage. 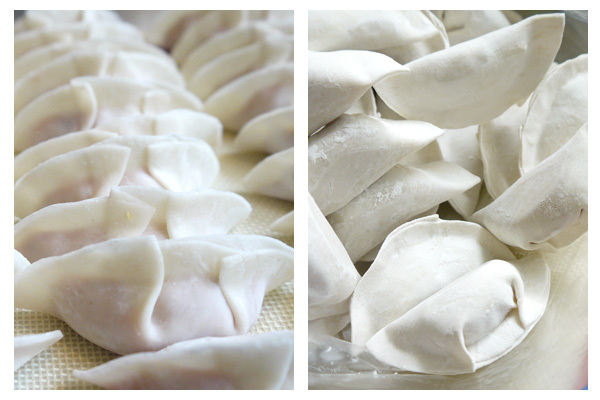 I sometimes make the dumplings from scratch, that includes making the wrapper from flour and water just like how restaurants do it – I could also control the thickness of the wrapper but it is time-consuming. So if I don’t have the time, I often buy ready-made wrappers from the supermarket which saves me all the kneading and rolling. Chop napa cabbage into little pieces, place in a colander - it will look like a lot but will shrink when the water is squeezed out. Add 2 tsp of salt into it and let it sit for about 5-10 minutes. Squeeze out the excess water from the cabbage, and drain. Set aside until ready to use. Add the following seasonings into the ground pork: soy sauce, sugar, rice wine, and minced ginger. Mix until incorporated. Mix in the corn starch. Add water in several additions, mixing after each addition. Mix in pickled cabbage, vegetable oil, and sesame oil. Place about 2 teaspoons of filling onto a piece of dumpling wrapper. Dab your finger with some water and spread the water around the edges of the wrapper. Fold the wrapper in half and press the edges together firmly. You can also make some creases on one side of the wrapper before folding in half to make it look nicer. Heat some vegetable oil in a non-stick fry pan in with medium heat. Place dumplings into pan. Add water until it reaches about ¼ of the dumplings' height. Place a lid on the pan and let it simmer with medium heat for about 5-7 minutes. Remove lid, the water should be almost all gone by now. As the water evaporates, the crust will start to form on the bottom, fry until the bottom of the dumplings are golden brown. I always make extra and freeze them and they can be steamed, boiled, or pan-fried without defrosting. To freeze, place them on a tray separated and place the whole tray in the freezer until the dumplings are frozen. Store them in a freezer bag until ready to cook. (Note that cooking time will be longer if cooking frozen dumplings.) It makes a convenient quick meal or an appetizer. You can also easily make chicken dumplings by replacing the pork with chicken. I’ve made a tasty vegetarian version by filling them with seasoned chopped cabbage, carrots, shiitake mushrooms, and Chinese vermicelli. It is very easy to be creative with the filling. You can tell when homemade food really makes a difference especially when you have fresh ingredients!